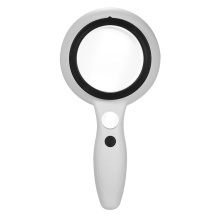 Nice Present for Parents – LED handheld magnifying glass with scratch-resistant 3pcs high power magnifying lens. Interchangeable 71mm lens for 2.5X & 5X magnification, 20mm lens for 12X magnification. Double-deck Resin Lens – Clear & distortion-free magnifying lens with comfortable ergonomic handle, suitable for children, adults, seniors, hobbyists and professionals. Lightweight Design – Clear & distortion-free magnifying lens with comfortable ergonomic handle, suitable for children, adults, seniors, hobbyists and professionals. Energy-efficient LED light turns ON/OFF with a simple button switch. Super Bright LED Light & Adjustable Brightness – 8 LED for the large lens and 1 LED for the small lens ensure better lighting effect under insufficient light or dark environments. & 2 kinds of adjustable brightness, meeting your different requirements in various occasions.